This is the story of teenager Hannah Baker, who sends tapes to the people who are connected to the thirteen reasons why she commits suicide. A story about friendship, despair and the responsibility we have for our actions and how they influence other people. A story which shows us how important it is to prevent a classmate from becoming a loner. "No one knows for certain how much impact they have on the lives of other people. Oftentimes we have no clue." 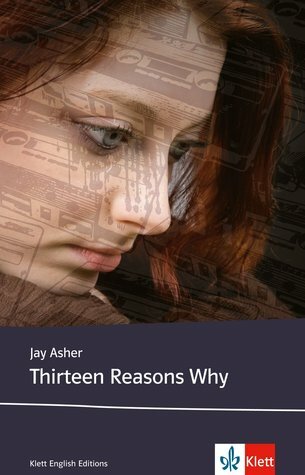 I read "Thirteen Reasons Why" for my English class so I wasn't that thrilled about it at first but it turned out to be one of the best books I've read for school so far. Hannah Baker's story is as sad as it is realistic and I think Jay Asher did a great job in telling such a serious topic with still a bit of humour as Hannah sometimes can be quite ironic. Clay develops a lot throughout the book as in his opinion on certain people at school and as well in getting to know persons who maybe have a lot of prejudice from others since he now knows that those rumours aren't always true. As in Hannah's development, you can see her break more and more as her stories go on and that in the end her mind is set and you couldn't have changed it although you would have known. The dual narrator made up a lot since you could firstly hear Hannah's stories on the tapes and secondly see Clay's reactions and feelings on what Hannah is saying which actually makes up even more suspense than the stories already do. Furthermore, Hannah and Clay are both strong characters with their own opinions on different topics. And even though Hannah has ended her life I think that after getting to know why she did it and what were her reasons and which people have added to it, it is somehow understandable why she did it but still sad anyways. There were some passages where I actually almost cried and was at least shocked about what people are capable of doing and how something small or even a joke or rumour can change someones life drastically and how it can as well change a person completely. I believe that this book really gives a good view into the life of a person who commited suicide and how they see the things that happened to and around them because other people often don't know why somebody killed his-/herself or saw it coming. I probably will remember this book for quite a while as the message of it is really strong (for me it's: you'll never know how your actions affect others and rumours aren't always true) and I really do want to see if I can change my attitude towards rumours as well as that I don't beliebe everything I hear. I've always been on the fence for this book, because of mixed reviews. This review got me thinking that I need to read, and soon! Great review :) .